Ranger Lake has been stocked to establish sport fishing populations of largemouth bass, bluegill, pumpkinseed sunfish, crappie, and rainbow trout. The lake is stocked with trout in the winter for ice fishing. 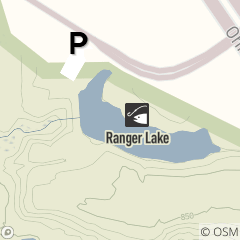 Ranger Lake is located off of Pearl Road between Whitney Road and Valley Parkway. Follow the sign to the Ohio Turnpike and the parking lot will be on the right (south side) just past the Strongsville Park-N-Ride.